Education • Alta High School students vie in "Shark Tank" setting and win thousands for college. 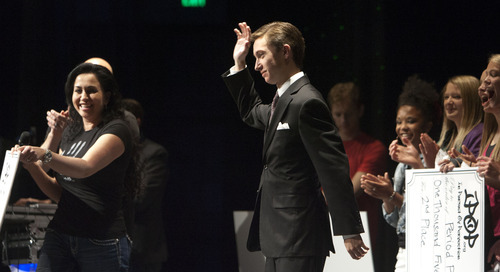 Steve Griffin | The Salt Lake Tribune First-place winner Sean O'Bryant waves to the crowd after being announced as the winner of Alta High School's first "Hawk Tank" mobile app idea competition Friday. His app, iScholarship, is designed to help students find scholarships for college. 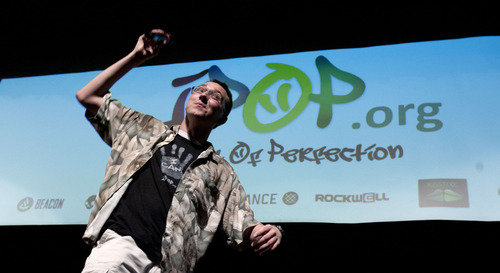 Sponsored by the IPOP Foundation, the contest played off the popular television show, "Shark Tank," in which entrepreneurs pitch ideas and business plans. Steve Griffin | The Salt Lake Tribune Josh Adams talks about his app idea, ifind, during Alta High School's first-ever "Hawk Tank" mobile app competition Friday. Sponsored by the IPOP Foundation, it plays off the popular television show, "Shark Tank," in which entrepreneurs pitch ideas and business plans. 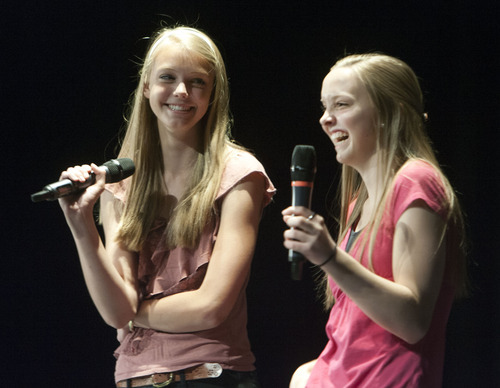 Steve Griffin | The Salt Lake Tribune Jessica Edington and Emily Serdar present their app idea, "period planner," during Alta High School's first "Hawk Tank" mobile app idea competition on Friday. The team came in second place. Sponsored by the IPOP Foundation, the contest played off the popular television show, "Shark Tank," in which entrepreneurs pitch ideas and business plans. 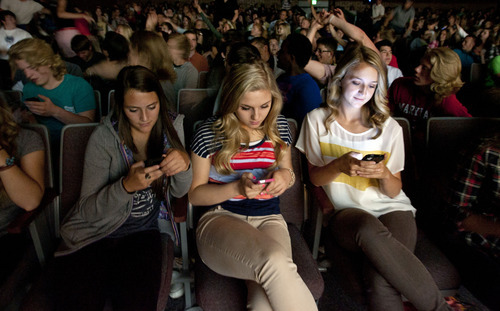 Steve Griffin | The Salt Lake Tribune Students in the audience text in their votes during Alta High School's first "Hawk Tank" mobile app idea competition Friday. Steve Griffin | The Salt Lake Tribune Jessica Edington and Emily Serdar shake hands with judges following their presentation of their app idea, "period planner," during Alta High School's first "Hawk Tank" mobile app idea competition Friday. Sponsored by the IPOP Foundation, the contest played off the popular television show, "Shark Tank," in which entrepreneurs pitch ideas and business plans. Sandy • Digitally raid a friend&apos;s closet. Blast an SOS to other girls after getting a period without warning. Or score the cash to afford college. Those mobile app ideas were among the winning proposals from a handful of Alta High School students who competed for thousands of dollars in scholarship money Friday. Designed to emulate the TV show "Shark Tank," which lets newcomers pitch start-up ideas to investors, the contest was judged by a panel of Utah business leaders and sponsored by Utah-based education foundation In Pursuit of Perfection. The student competition reflects a rapidly changing technology industry, where entrepreneurs can start businesses with about $10,000, said Joe Grover, a judge from Mercato Partners, a Utah investing group. "That&apos;s just a total shift from two decades ago." Hundreds of students created apps, and their ideas were winnowed to 10 proposals from about a dozen students. During Friday&apos;s competition, songs by Justin Timberlake and Britney Spears blared through the packed auditorium and confetti sailed upward. It culminated with an auditorium-wide Harlem shake dance session led by Principal Fidel Montero. Junior Sean O&apos;Bryant won first place and $2,000 for iScholarship  an app that turns up a list of matching scholarships after students type in their grades and other information. O&apos;Bryant, in a black suit and tie, guaranteed judges that colleges would pay to advertise on the app, which he hopes to bring to market. He plans to go to medical school. "My parents don&apos;t even know that I was in this competition," O&apos;Bryant said afterward. "I didn&apos;t mention it for fear that I might not have made it at all." Juniors Jessica Eddington and Emily Serdar took second place and $1,500 for the Period Planner, an app that would send women reassuring messages on days leading up to and during their period. It could also alert friends of any emergency need for a tampon or pad. Senior Avery Smith took third place and $1,000 for Geni, an app for users to digitally catalog their clothes and warn schoolmates with the same items not to wear them on a given day. "What if I told you I could make your closest 10 times bigger at no cost?" he said. Other top 10 ideas included a hike-rating app to rank outdoor trails, a digital hide-and-seek game and one to let users make their own mash-ups from popular songs. "Not every one of these kids is going to go on to be a Bill Gates," Montero said. "Hopefully one or two do, but I think all of them benefit." The foundation plans to run the contest again next year, said co-founder Amy Rees Anderson, whose daughter attends Alta. She was the CEO of MediConnect Global Inc., sold for $377 million in 2012. "Everyone knows what a doctor does, what a lawyer does, what an accountant does. But if they don&apos;t feel like they fit into those boxes, I think a lot of those kids lose hope," she said. The contest, she added, "let&apos;s them say &apos;Hey, I can do that.&apos; "